An indication of whether a flow is laminar (Re below 2100), transient or turbulent (Re above 2100) is provided by a dimensionless number called Reynolds. 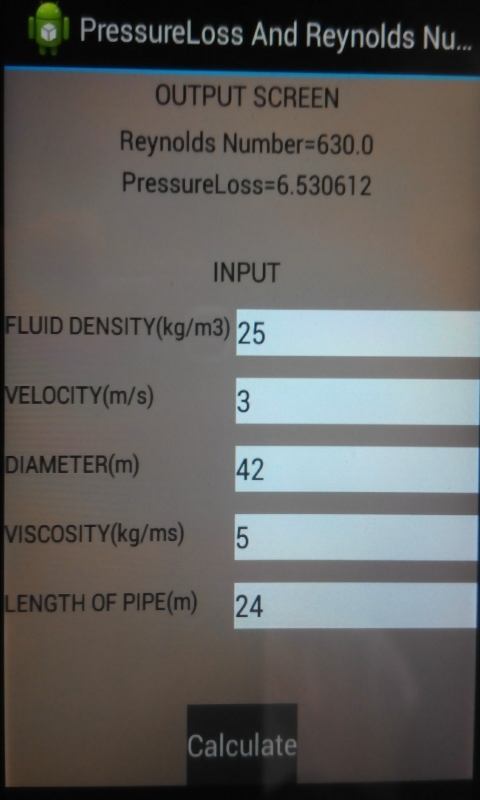 This application calculates Reynolds number and pressure drop of a fluid in straight circular pipe. Input parameters for this application include fluid density, mean flow velocity, pipe diameter, length of pipe and absolute viscosity. It must be pointed out that f=16/Re equation is used to calculate friction factor f, for laminar flow in smooth pipes and Blasius correlation f=0.079Re^-0.25 is used for turbulent flow calculation in smooth pipes, so long as the Reynolds number is below 100,000 and above 2100 within which range the Blasius correlation approximates the equation very well. Then, the pressure drop is calculated using skin frictional loss equation in straight pipe. This equation applies to both laminar and turbulent flow provided the fluid is incompressible and the flow is steady and fully developed.